Toddlers, I told you this day would come. You've waited, alone and ignored, while your mothers spent hours on Pinterest* trying to convince the world that they too are capable of making cinnamon rolls from scratch. You've rolled up to the park wearing bows the size of compact discs on your head; Michael's craft store abominations of glue and plastic flowers. You've sat naked in potato sacks and on wooden benches while your parents Instagramed ridiculous photos of you adjacent to wheelbarrows. 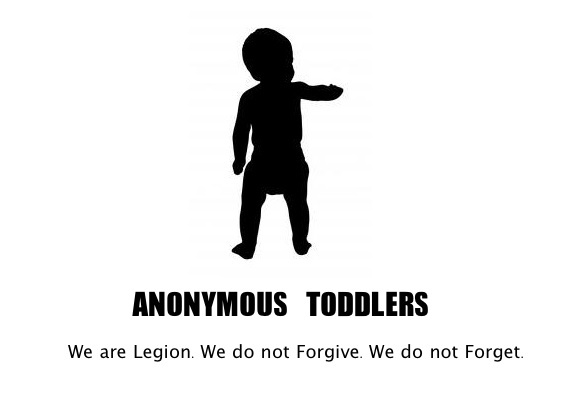 Both websites are currently down thanks to Anonymous Toddlers, a special team of brilliant teething minds (they're biters). We can't promise that the sites will stay down. Adults are a crafty bunch. But this will be a warning. PARENTS: Our demands are simple. Spend less than 15 minutes a day on Pinterest. Use 14 of those minutes searching for new cake recipes. Bake that cake. Instagram us if you must but do not spend an exorbitant amount of time trying to achieve the perfect shot. Do not make us eat Instagram-approved foods just for the purpose of said shot (corn on the cob, homemade fruit leather, homemade cheese, etc.). *It has come to my attention that Pinterest is back up. Seems as if a key member of Anonymous Toddlers was distracted by a leaf outside the office window for a significant amount of time. Then another team member noticed a nearby construction site and the entire group went outside to watch for several hours. We're trying to get them back on task but nap time is quickly approaching.